Little did the unassuming Aussie antique dealer know what he was about to unleash upon the toy-collecting world. Most likely found at a local yard sale, the toy looked interesting enough... I mean, sure, it was in pieces, each cog and gear separated by a kiddy toy surgeon many years ago, but those pieces were of nicely lithographed tin, in great condition, and all packed neatly within their original cardboard box. In early November 2002, the toy went before the digital camera (picture perfect pose: two outer tinplate halves placed together to give an idea of its original appearance; its chaotic mechanical innards placed to one side, like some clockmaker's nightmare; and its attractive box surveying the entire tableau). It was then listed on auction giant Ebay with a starting price of US$100, no reserve. Within a day, it was into the thousands... and destined to make history. And what does all that have to do with this article's title, you may ask? I'll resolve that with a question: what do our three previously named icons (of comics, history, and comics again) have in common? 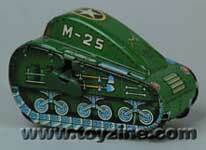 Yes, dreadful titular pun intended: the answer is tin toy tanks. The Sailor Man, the General, and the Superhero... all three were immortalized in Japanese tinplate form during the explosive boom in toy production from the 1950s to the 1960s. And if I told you that one of them was worth around 14,000 US dollars, would you know which one? Well, don't feel so bad... you're about to find out. Before we begin, let's get one thing straight: there's tanks, and there's tanks. First, you've got your cute, tiny nostalgic killing machine, and our three boys all existed in this form. The General was represented by a quaint little wind-up 4 incher, simply named on its unassuming box 'Patton Tank'. Sadly, the poor old General's likeness did not even appear on his toy or its box. Meanwhile, Line-Mar Toy's (part of the ubiquitous Marx toy family) decided on the old '2 for the price of 1' trick with Popeye and Superman. Using the same pressings, moldings and machinery, they made them both into tiny clockwork 'Turn-over' tanks. Line-Mar punched out many character turn-overs, and all relied on the same principles of movement: a flat strip of diecast tinplate beneath the tank was lithographed with each character's image. When in action, the mechanism forces the character and tank apart, which results in the tin hero appearing to lift and turn over the tank. Popeye and Superman, also in the four inch range, each have a value of around 750 US dollars MIB, with the General not even reaching a quarter of this. So where's the 14 Grand, you ask? Like I said, there's tanks, and there's tanks. Now it's on to the Big Guys. The marketing folk at Line-Mar toys must have been happy with the wind-up Turn-overs' audience response. Otherwise, they wouldn't have sunk the dough into making the deluxe, battery-operated version. This fantastic, nearly foot long toy was greatly detailed, and its mechanism comprised a jointed three-dimensional animated figure involved in an imaginary push-and-pull duel with an oversized tank (maybe a Patton? Poor old General!). 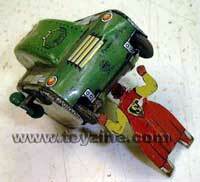 The Superman version is certainly well known to tin toy fans, and is a cool toy with a cool value: 2000 dollars US MIB. I know, I know... where's the 14 Grand? The final answer is spinach. 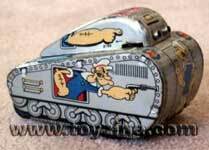 Tiny four inch clockwork Popeye 'Turn-over' tank, value at around 750 US dollars MIB. 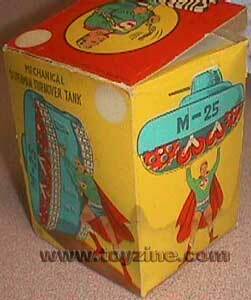 Tiny four inch clockwork Superman 'Turn-over' tank. 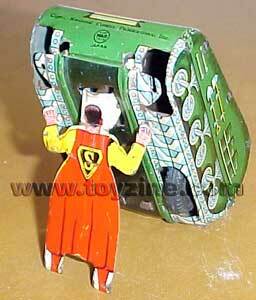 Tiny four inch clockwork Superman 'Turn-over' tank, value at around 750 US dollars MIB.